Experts in the legal field are wracking their brains and resources to find a solution to the access to justice gap. For some lawyers, technology is the key to solving the issue. Many of these progressive lawyers met at Lawgical’s Denver office in order to discuss what technologies they are currently using to close the gap and future actions to achieve access to justice for all. Experts gave Darwin Talks at the event to inspire innovation and action and we at Legal Talk Network recorded podcasts so that this information reaches a national and international audience. Richard Granat, Founder/CEO The Granat Group, LLC. “How can lawyers and legal companies merge technology with legal plans and services,” Mary Juetten asks. Dona explained her experience with Institute for the Advancement of the American Legal System’s (IAALS) Center for Out of Court Divorce and their struggle to get clients through the door. This experience lead her to say, “I am a true believer against ‘if you build it, they will come.’ I think there’s a lot more we need to find out from the court consumers before we up here decide this is what you need, this is what is going to be good for you.” Part of the solution to this, she found, was taking inventory of self-help resources like automated forms and taking a closer look at the online resources that clients weren’t using. She said, “We need to figure out not only what the consumer wants but what is the consumer willing to use for certain types of legal actions.” This may mean, she explained, that using non-traditional methods may be a scaling process that starts small and grows as clients adjust to using these newer means of legal service. Keri then chimed in with agreement, saying that technology is a tool that doesn’t replace the personal relationships between attorneys and their clients. 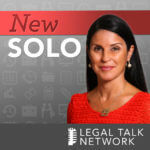 She said, “Clients want to be able to access information quickly and easily with technology, but you still have to have personal service.” Technology, according to Keri, is a means of connecting to the lawyer who actually provides that meaningful relationship. Pat agreed, saying that the process often gets in the way of building a relationship. Especially in family law cases that involve a lot of tension, a personal touch is necessary. “If technology doesn’t improve the relationship than we need to not use that technology,” he said. The panel then addressed a question from David Fisher, CEO of Integra Ledger: “Do model rules restrict supply and innovation within the legal industry?” Mary also expanded on the question by applying it to the broader access to justice problem and the fact that lawyers don’t want change within the industry. Pat believes lawyers need to stay relevant. He said, “I think millennials and people really are not interested in hiring lawyers; they’re interested in getting their legal solutions resolved.” And to stay relevant, Pat said, lawyers need to show that they care about the case and the client. Along with competence and price, this is one the most important aspects of why a client hires and keeps a lawyer. For more information about the panelists or to get a deeper dive on their access to justice discussion, check out these On The Road episodes or visit Evolve Law’s website.